Running your own business can be filled with tiny and large mishaps. From hiring employees that are less than stellar to forgetting to process the payroll, owning your own business is going to come with a lot of little mishaps. However, as a business owner, don’t you want to spend more time focusing on your business instead of all of the little mistakes that occur? At Journey Business Solutions, we strive to offer you that ability to focus on your business while we deal with all of the merchant and payroll services. We understand that you have a lot on your plate with owning a business, so why not leave some of the facets of business up to the experts? In today’s blog, we’ll be going over some of the mistakes that you may be making with your payroll services and how you can avoid them with Journey Business Solutions. Mistakes happen in business, but the larger the mistake, the more costly and time consuming it can become. For example, if you fill out employment taxing incorrectly, then you could pay a fee that’s also known as the 15 percent failure to deposit penalty by the IRS. Instead of taking a live-and-learn approach to your payroll services, avoid the mistakes by hiring a service that has your best interests in mind. A lot of new business owners have a lot of their plates, so sometimes things fall by the wayside. One of those things is processing payroll late or even not at all. While it’s understandable because you’re wearing many different hats, you have employees that are relying on you to get the money they are owed. Even if you forget to process it once, your employees are going to be very concerned to know when they are going to have a paycheck. It is their livelihood after all. To reduce this risk, it’s beneficial to hire an outsourced payroll service to make sure that your employees are happy and stay happy. People who don’t work at the bank tend not to know the holidays that they are closed. As a business owner, you should be aware that bank holidays are not considered to be business days and payroll is unable to be processed. For example, if your employees get paid every other Friday and one of those Fridays is a holiday, then the payroll will be either the day before or the Monday after depending on the payroll services. It’s vital that you are aware of the holidays because the bank will be closed and the payroll processing will need to be changed according to your business. As we mentioned earlier, depositing and reporting taxes for your employees incorrectly can cost you a lot of money. Taxes for your employees and business can be a little overwhelming because depending on where you’re located, you may have to do something different. As a business owner, you’ll need to file the federal, state, and the local taxes with the appropriate authorities. If you forget to pay taxes for one of these levels of government, then the IRS can charge a penalty fee. Once you’ve gathered the payroll taxes for your employees and put in your share, you’ll need to do the government taxes and file on one or two types of schedules. Lastly, another mistake that a lot of people make with payroll services is paying the incorrect amount. A lot of people who don’t know how to do payroll will make mistakes. This can occur for many different reasons. You could have entered the amount incorrectly or your employees may have worked more hours than they usually do. When you put in the amounts for payroll, it’s vital that you double check everything and make sure the tax holding amounts, as well as the payment information, is correct. If even one of these numbers is off, then you’re going to have an avalanche of errors. 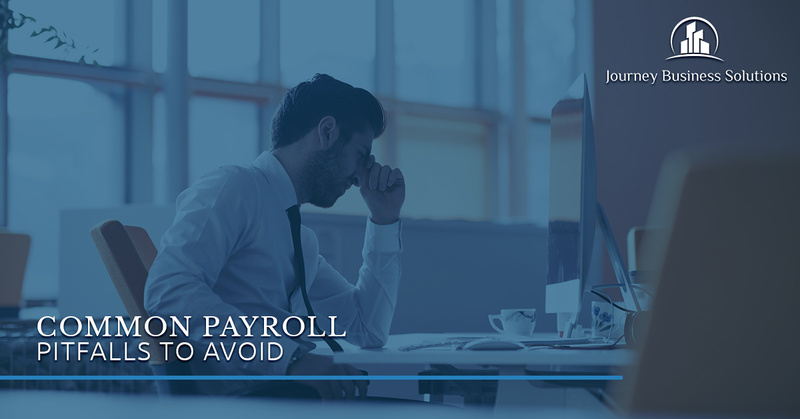 If you want to avoid making these mistakes, then take the time to hire Journey Business Solutions for our payroll services. We make payroll services easy by offering an all-in-one support system that will provide you with the solutions you need.